Hoping to solicit some opinions and feedback about my current situation. To make a rather long story short and to the point (I could write a book about my experiences), I took in a stray cat around two months ago - she was extremely affectionate and well behaved from day one. Now what I didn't realize at the time was that she was a very pregnant cat. I kept her around, and she had a litter of 3 kittens 4 weeks ago. What I've come to realize is that Newt (the name I've given the mommy cat) is very much an outdoors cat. She wants to go outside, every single night. My original intention was to keep her, but the reality is, I don't think Newt wants to stick around (not under my rules, anyway). The situation is complicated by the fact that she has 3 kittens to nurse. What I'm doing as a temporary solution is to go out on walks with her (because there's no way I'm just going to let an un-spayed cat out the door unattended, especially with 3 kittens still relying on her. She could very well come back knocked up again). Now, I'm sure some cats are very pleasant and amenable to walk. Newt, not so much, although I've learned quite a bit about her movement patterns and tendencies so that I've made it a tolerable experience for the both of us. Newt can't get spayed for another two months, at least. I'd like to hear some thoughts on how best to deal with her outdoor tendencies until then. I have a relatively small space and no backyard, and will continue to take her on walks when required. Having said that, going out on hour+ walks every night is not really something I anticipated doing. Add to that, she's often times still quite restless when we return from our walk. My next decision is what to do with her afterwards once the kittens are weaned and Newt has been spayed. If by some miracle her outdoor tendencies are dramatically reduced or eliminated entirely, I'm definitely open to keeping her, but I don't think that's going to happen. If I do give her up for adoption, what type of home would be suitable for a cat like this? Would she be suitable for any type of home environment? If not, what other options are available? One final remark - Newt is an otherwise lovely and adorable cat to have around (and she's been a pretty good mom as far as I can tell), so I don't want to give the impression that she's a "bad" cat, far from it. But I think being indoors just cramps her style. Welcome to the board! Thank you for taking in this kitty. What I think is happening is that Newt still feels the need to go outside because she is not fixed and looking for some lovin! Once she is fixed it will likely be a different story. What does she do to let you know she wants outside? can you redirect her with some playtime indoors if your not up to walking her? The other thing is maybe she just feels the need to have some alone time from nursing. Can you give her some space in another room perhaps? maybe a set up so she can look out a window or something like that? I know the kittens are still young but can she not be fixed in a few weeks once they are weaned? I hear ya! I think the meowing is the longing for some action unfortunately. Does she eventually stop? it must be tough! I hate it when they meow like that too because its not the normal meow its the I am in heat meow! Dont be surprised to find some males hamging around! they will go for miles looking! What are the plans for the kittens? If that the end you decides Newt does not want to be an indoor cat could you find a person that has a barn , she would made great barn cat. I am so glad you took the cat in as you save her kittens and the mother lives . Exactly, her meowing eventually transforms into a rather annoying, 6-second meeeeeeooooooooooow. She does eventually stop - sometimes she'll only complain for 30 minutes or so, other times, it could be well over an hour or two (this is after I've already taken her for a walk) - it really depends on how eventful the walk is. If she has caught on to the scent of another (presumably) male cat, then watch out! Actually, the other night, we encountered another cat which followed us for close to an hour. He actually looked like he could be the father of the kittens. This is what I was thinking as well, but I wonder how many people out there have barns and are willing to take in a cat? I guess I'll find out when the time comes. This is NOT a feral cat, but one who has gotten used to be outside. You are doing the right thing by walking her so she will be SAFE to nurse her kittens until they are old enough to be adopted . If you keep her inside, ignore her meows (I know, very annoying) she will end up getting used to be inside too. If you do end up giving her up for adoption, I would be adopting out to somebody willing to put a cat pen in their back yard to keep her safe. A free running cat is a dead cat. Maybe not in a year, but eventually it's chances of living a full life dwindle. I have yet to have had a momma cat who wanted to be far from her kittens. 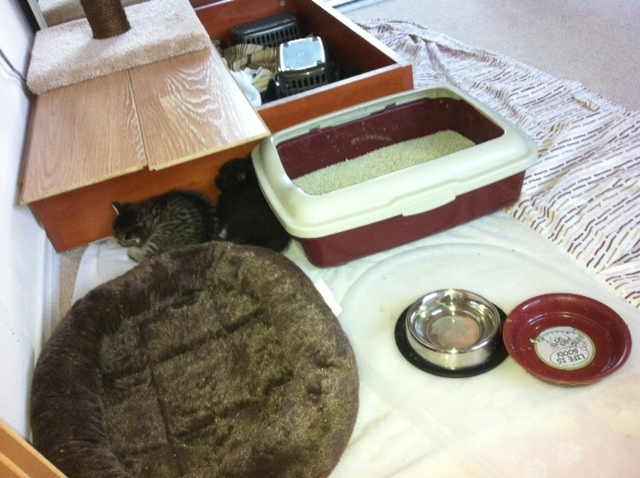 Out of the kitten box, yes, but they have all preferred to be in eyesight of their kittens. I have to agree with Winston, this sounds like an "I'm in heat type of behaviour". NOOOOOOOOOOOOOOOOOO to barn cat, unless its a cat that has been born into that lifestyle, trained by it's momma and is in it's established territory. That poor cat will have to make a territory for itself by fighting off the current cats. That is just cruel in my books and could lead to a very slow, drawn out death. I just wish there's a safe way to get her spayed sooner (rather than having to deal with this behaviour for another two months) - the vets I have spoken with indicated I have to wait another few weeks after the kittens are weaned, since her glands will still be inflamed at that time. I was given a cat that was found living outside it was not a feral cat. I end up letting her live outside as she was so unhappy being a cat house. She was spayed too and that did not help. I still fed her and took her to the vet as needed . Then what should be done if the cat hate being a house cat? It would be horrible to put her in a shelter , I think if the right person had a barn and no others cats it would work out. Newt looks part Siamese and they're know for being very loud and bossy cats . This could be part of the reason she is so talkative. She is a beautiful cat and and the kittens are so cute. We have had him almost three years now...he still sits at the front glass door and meows to get out once in a while. He is allowed out in the back on a leash when I am outside. That seems to be a good compromise for him. Just wait and see once she is spayed and the cold weather arrives weather she still wants to be outside. Even the ferals int he neighborhood don't want to be outside cats once winter comes. Thanks so much for taking her in and letting her have her sweet kittens in such a safe place. Good luck and let us know how it goes!!!! If she still makes all that noise even after shes been for a walk, I would keep her in the house. By the time shes been spayed she will maybe? be more used to being an indoor cat. Can you lock her and the kittens in a room that yoiu wouldn't hear her meow, just until shes not in heat anymore? Yesterday was a good day; she was not at all insistent to go outside - just a couple of half-hearted meows that lasted all of 5 minutes. Otherwise, she was just content lounging around. Admittedly, I distracted her with a variety of food, but this never worked before. Maybe it was the cool and very wet conditions outside (we had a rather big storm that came and went during the day). Hopefully this is a sign of things to come, but only time will tell. Nope, a cruel and unusual punishment is to put her outside to fend for herself! My foster mommas are kept in a room with their kittens 24/7 because I can't let them out due to my cats. They were all just happy to have food and warmth and no stress. I did provide a cat tree in the room to get away from the kittens once they start exploring outside the kitten box. I was just going over your posts from yesterday, and reading the explanations of the meowing and being followed by the male cat. This jogged my memory to an article I read some time back about female cats coming into a false heat a few weeks after giving birth. This could explain the meowing and would also explain the male cat following you. Give it a few days and see if the meowing quits. If it does maybe this was the problem and if it was a problem and you will not be able to get the cat fixed for two months, it's going to return a couple of times at least before you get her into the vet. You are toying with the idea, if worse comes to worse of putting the cat out as a barn cat. I have lived in the rural areas most of my life, and I know what the barn cats go through. If at all humanly possible, I would be looking for a responsible person for a companion for Newt. Barn cats have a very short life - three to five years if lucky. Quite often they are taken by a Fox or coyote, and depending on their size they can end up as feed for Hawks and large owls. People in rural areas at certain times of the year get a deluge of ditch babies dumped alongside the road in front of their homes that they have to find homes for or end up having to put them down themselves if they are unable to keep them. So quite often the farmers have a deluge of cats that have been dumped and have taken refuge in the barn. Besides, a cat that has not been a barn cat from the beginning, is going to cause other problems. Cats are territorial animals to a point, and an outsider will really add difficulties to every animal involved. The resident cats will make it very uncomfortable for your cat, if you choose this route. Very beautiful kittens! Great photos, you seem to have a talent for photography. This happened to a neighbor of mine I have mentioned it I think. He finally broke down and let her out and she was poisoned. The kittens needed to be bottle fed, that is where I came in. I remember my first cat who broke through a screen window and subsequently knew he could do this all the time. We eventually let him come and go this way. He disappeared for a week once and when he came back perfumed and wearing a collar we were astounded. Then one day a woman looked into my window where my cat was and said out loud "that's my cat, they stole my cat!". I told her that was my house and cat and asked her why she thought it was hers. She explained how she obtained him as a stray the week before. He was now three. I told her we had him since he was a baby and that the week before he had come home washed, perfumed and wearing a collar. She became red faced and walked away. He eventually went missing and never came back. Neighbors told me the lady had moved. My cats don't go out now. If your cat has another home somewhere I am sure she is torn between caring for her kittens and seeing her family. She may also be in the false heat someone suggested. At any rate I think you did the right thing because she was not operated on and pregnant. You are doing the best you can and I think till she can be operated on you are protecting the kittens and mother. People learn from experience if she did make her way back home eventually operated on I am sure the owners would get the message. I'm not so sure about this "false heat" thing. It's normally something that happens after being spayed, not before. Any heat of any kind, even so soon after having kittens, will result in another litter if the cat is allowed to mate. A few years back when I had unspayed ferals around they would routinely be pregnant again a few weeks after having one litter. Nothing false about that. Reg is completely correct in saying there aren't many farmers who would take on more cats. Most farmers have more than they want in the first place and, if the coyotes, cars, farm machinery, livestock, etc. don't get them then the farmer will. I have been told of special buckets filled with water with lids on kept for that purpose. Farmers who fix the cats under their care and look after them properly are few and far between. I thought I should provide a bit more detail about Newt which might help deciding how best to deal with her tendencies (now and in the future). I've been walking Newt for about 3 weeks now, averaging about 5-6 walks a week, ever since the 2nd incident below. She had previously 'escaped' twice before since I adopted her - once before the litter arrived, and once after. The latter incident caused me to drive to an emergency pet hospital to pick up some KMR in the middle of the night as I had no idea when (or if) she was coming back - the kittens were only 5 days old at this time. Fortunately, she came back around noon the next day. This is when I decided I wouldn't let her out of my sight. Hopefully she didn't get knocked up again during that particular escapade. I've met people around the neighbourhood and been told a lot of stories about this particular cat during her walks. Apparently, she had a previous owner somewhere in the area, or so I'm told (one strikes up the most interesting conversations with strangers when walking a cat). So it may certainly be true she had another home (or two) previously. Back to the present... I haven't walked her the past two days. She complained a lot more last night, but nothing close to her worse tantrums (I'd rate it around 3/5 on the Newt complaint scale, easily 1/5 the night before). My next question is, is it better to try and stop her walks cold turkey, or should I just gradually ease her off the walking routine? If I can manage one walk a week without her complaining, I'd be pretty happy with that. I totally agree sorry I realized it wasn't clear in my post. I am not sure though how feasible it will be in the long run. Just from my experience with the friend who took in a pregnant stray. I hope this cat will adjust better without running past the door as he is leaving for work, that is what happened to my friend. If you can walk her safely, I would stop them slowly. She'll get used to not going out. I really am surprised about her wanting to go outside, I would have thought she would have been so relieved to have food, security and shelter she would have wanted to stay inside for a bit. I find with cats, if you walk them at the same time everyday, they only bother you when they know it's "time" for something. My cats NEVER are walked at night, so when the sun goes down, they never ask to go out. Wow... Newt is the exact opposite. I find it too difficult to walk her during the day - too much noise and distractions. Kind of ironic for an outdoors cat, but she will come to a dead stop at the slightest unexpected noise (car horn, noisy children nearby). The same goes with visual distractions. So I pretty much have to walk her when it's dark out. And I suppose she was happy to have food and shelter. She was fine being indoors when she first arrived. I would have the front door open and at first, she wouldn't even go near it. After about a week or so, she would take a quick peek out and walk back in. Eventually, that grew into walking out onto the patio for several minutes, and lead to the current situation now of pleading for walks on most evenings. BTW, below is the little nursery area I put up for the kittens. Their nest was my sock drawer underneath my bed. I moved it to a spare room once they were big enough to climb out and start exploring - I needed a bit of peace and quiet, and I was also worried about waking up half asleep one day and accidentally stepping on one of them.